Saudi Arabia expelled the Canadian ambassador Monday and froze "all new business" with Ottawa over its criticism of the ultraconservative kingdom's arrest of women's rights activists — yet another warning to the West reflecting Riyadh's newly assertive foreign policy. The sudden and unexpected dispute bore the hallmarks of Crown Prince Mohammed bin Salman, Saudi Arabia's 32-year-old future leader, whose recent foreign policy exploits include the war in Yemen, the boycott of Qatar and Lebanese Prime Minister Saad Hariri's surprise resignation broadcast during a visit to the kingdom. Hariri later rescinded the resignation, widely believed to be orchestrated by Riyadh, and returned to Beirut. Analysts say the dispute between Riyadh and Ottawa shows Saudi Arabia won't accept any outside criticism and will continue flexing its muscles abroad, especially as the kingdom enjoys a closer relationship with President Donald Trump. [post_ads]"This message is obviously not just being sent to Ottawa," said Giorgio Cafiero, the CEO of Gulf State Analytics, a Washington-based risk consultancy. "It's a message to countries across Europe and across the rest of the world that criticism of Saudi Arabia . has consequences." The Saudi Foreign Ministry made the announcement early Monday, giving Ambassador Dennis Horak 24 hours to leave the kingdom. It wasn't immediately clear if he was in the kingdom. Saudi Arabia said it would recall its ambassador to Canada as well. "Any further step from the Canadian side in that direction will be considered as acknowledgment of our right to interfere in Canadian domestic affairs," the Foreign Ministry said. "Canada and all other nations need to know that they can't claim to be more concerned than the kingdom over its own citizens." Saudi state television later reported that the Education Ministry was coming up with an "urgent plan" to move thousands of Saudi scholarship students out of Canadian schools to take classes in other countries. The Saudi state airline, Saudia, said in a statement on its official Twitter account that it would suspend all flights to Toronto starting next Monday, Aug. 13. Bahrain and the United Arab Emirates have publicly backed Saudi Arabia in the dispute. Canadian Foreign Minister Chrystia Freeland said in a statement that Canada was "deeply concerned that Saudi Arabia has expelled Canada's ambassador in response to Canadian statements in defence of human rights activists detained in the kingdom." Freeland also addressed the dispute in Vancouver. "We stand by what we have said. We're always going to speak up for woman's rights and that's not going to change," she said, adding that it wasn't the first time Canada has spoken out about human rights in Saudi Arabia. Freeland said it would be a shame if Saudi students are deprived of their right to study in Canada and said they continue to be welcome. She said the Canadian Embassy in Riyadh was continuing regular operations. She declined to say where the ambassador was, but said he was safe. "Our diplomats have asked procedural questions today and we're waiting for answers for how Saudi Arabia intends to go forward with the relationship," she said. The dispute appeared centered around tweets by Canadian diplomats calling on the kingdom to "immediately release" detained women's rights activists. Among the arrested activists is Samar Badawi, whose writer brother Raif Badawi was arrested in Saudi Arabia in 2012 and later sentenced to 1,000 lashes and 10 years in prison for insulting Islam while blogging. His case long has been raised by international human rights groups and Western diplomats, including Canadians, who have called on Saudi Arabia to free him. His wife, Ensaf Haidar, lives in Canada and received Canadian citizenship in July at a Canada Day ceremony with their three children. Freeland tweeted about the arrests on Thursday. "Very alarmed to learn that Samar Badawi, Raif Badawi's sister, has been imprisoned in Saudi Arabia," she wrote. "Canada stands together with the Badawi family in this difficult time, and we continue to strongly call for the release of both Raif and Samar Badawi." Saudi Arabia in June lifted its ban on women from driving cars — a ban Samar Badawi and other women's rights activists have long campaigned against. However, supporters of women's rights were arrested just weeks before the ban was lifted, signaling that only King Salman and his powerful son, Crown Prince Mohammed, will decide the pace of change. Saudi women still need permission from male guardians to travel abroad or marry. It isn't clear what new business would be affected by Saudi Arabia's expulsion of Ottawa's envoy. Canada receives 10 percent of its imported crude oil from Saudi Arabia, while bilateral trade between the two nations is $3 billion a year. Armored tanks and personnel carriers have been Canada's biggest recent export to the kingdom. A London, Ontario-based firm called General Dynamics Land Systems signed a $15 billion deal with Saudi Arabia in 2014 to export its light-armored vehicles to the kingdom, the largest-ever arms deal for Canada. Freeland said they are awaiting a response for what it means for that deal. The dispute with Canada is part of a larger pushback against external criticism, analysts say. Germany similarly has found itself targeted by the kingdom in recent months over comments by its officials on the Saudi-led war in Yemen. It's also not the first time Saudi Arabia has lashed out diplomatically over the Badawi case. 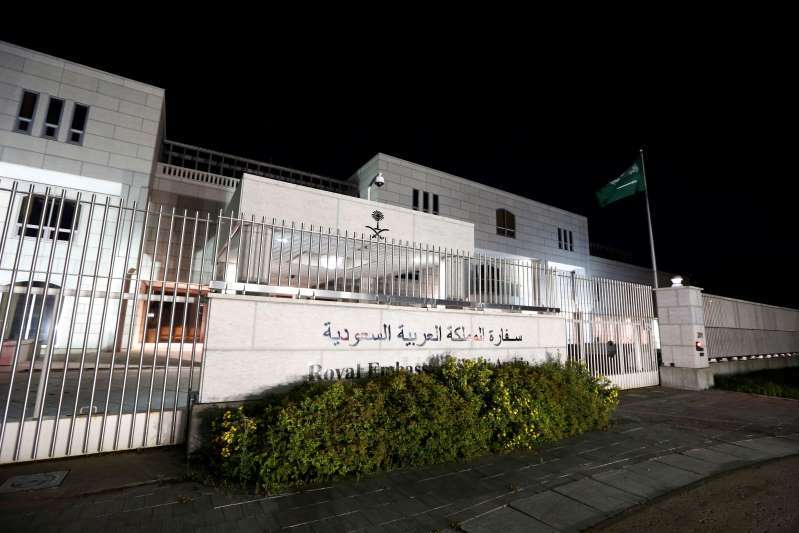 In 2015, Saudi Arabia recalled its ambassador to Sweden and stopped issuing work visas for Swedes after the Scandinavian country's foreign minister described the Badawi court decision as "medieval" and the kingdom's ruling Al Saud family as presiding over a "dictatorship." Saudi Arabia also expelled Iran's ambassador over attacks on its diplomatic posts following its 2016 execution of a prominent Shiite cleric. Ayham Kamel, the head of the Eurasia Group's Mideast practice, said Canada should have expected repercussions for championing the Badawis, given Crown Prince Mohammed's assertiveness. "The win (for the Saudis) is that everyone will get the message," Kamel said. "This is not just to Canada's mailbox. It is about sending a message to the entire West that you don't get to lecture us.